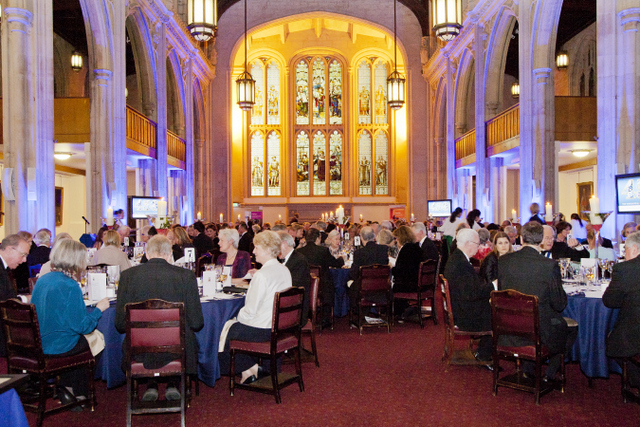 Chosen by Past Master Colin Hart – the Guildhall Library was the setting for the Livery’s main fund raising initiative for City Gateway and our associated charities. Liveryman James Brook-Ward had kindly volunteered to organise what would be an exciting and enjoyable evening in the heart of the City. Raising funds would not be an easy task with the backdrop of deep financial gloom. That said the Livery rose to the occasion and filled the stunning iconic building to capacity for a gala dinner. The tall vaulted ceilings of the library were lit with ‘upward and downward’ purple strobe lighting which delivered dramatic effect on the whole setting. We sat down to a fine three course dinner brilliantly organised by the Clerk. At the end we had a massive auction undertaken by the ever professional resilient auctioneer - Nick Bonham. It was also the culmination of the Master’s year long raffle prize being a stunning sculpture of a huge female hippopotamus done by the world famous sculpture Mark Coreth. The guest speaker was the Olympic Minister Hugh Robertson who delivered an exceptionally impressive preview of what was in store for the Summer 2012 Olympics. His speech was supported by an exceptionally interesting PowerPoint preview. The entire evening raised in the region of £22,000 – to which the livery is to be thanked for their wonderful contribution. A popular prize, use of past Master Nick Charrington's bus!